Seven weeks and counting! Our safari draws ever-closer and preparations are almost complete. In the weeks leading up to departure, we hope to keep the blog interesting with anecdotes from previous safaris and bits and pieces about the areas we shall be travelling. In our last post, we spoke about some of our memories of encounters with the elephants in Tsavo East National Park. This time we will talk about the lions of Tsavo. The movie "The Ghost and the Darkness" takes a healthy chunk of artistic licence in presenting the amazing story of the Maneaters of Tsavo but the truth of the story is no less incredible. In the last few years of the 19th Century, Britain was attempting to create a railway link from Uganda to the Indian Ocean port of Mombasa in Kenya. In actual fact the railway was never intended to reach Uganda but would run to the shores of Lake Victoria at what is now known as Kisumu, where freight and passengers would be ferried across the lake to Uganda. Thousands of workers were brought in from other colonies, especially India, to create what was referred to at the time as "The Lunatic Line". As the line progressed through Tsavo, work on it ground to a virtual halt because the workers were gripped by a terrifying fear. Lions in Tsavo had begun to prey on the railroad workers and as the number and frequency of deaths grew, panic spread through the camp. In one particularly audacious incident, Superintendant Lyall was pulled from a railroad carriage and devoured. 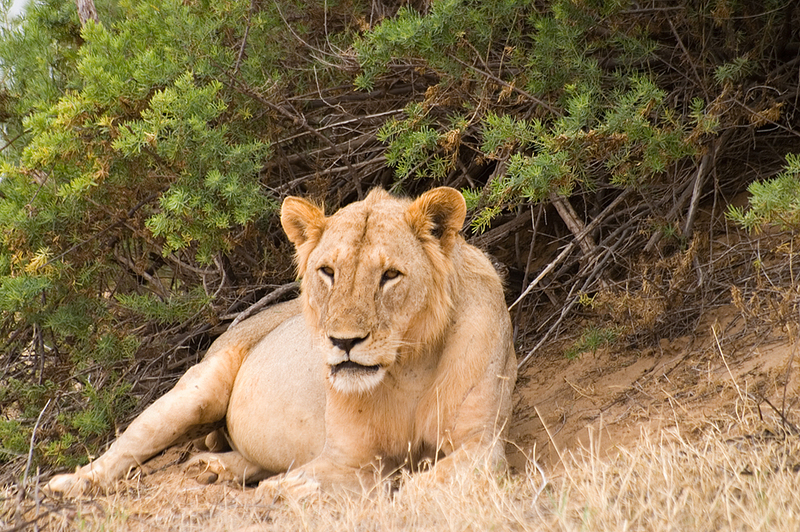 It took several months before the lions responsible were eventually shot by Colonel Paterson. The two enormous males responsible for the killing spree were both around nine feet long and, like many Tsavo males, had no mane. You can see the stuffed corpses on display in the Chicago Field Museum. 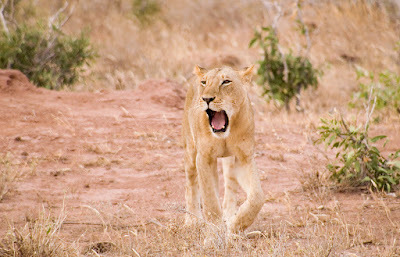 Tsavo lions have many peculiarities: they are extremely large; very few males have manes and many of those that do have little more than a beard and a Mohawk like the fellow pictured above; unlike many of their cousins elsewhere, the males take a very active role in hunting, allowing the prides to regularly bring down large prey like buffalo. Our experiences with lions in Tsavo East have thankfully been no more than thrilling. We spotted the male above by the Galana River where, judging by his bulging belly, he was happily digesting a very big meal. 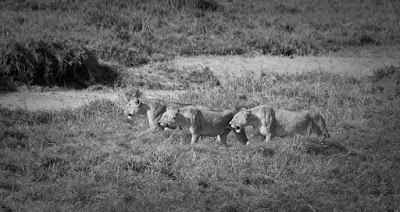 We have also witnessed a failed attempt to hunt zebra at Kanderi Swamp (the place where we saw the huge elephant gathering mentioned in our last post) by a group of five lionesses, three of whom lined up nicely for Karen's shot below. 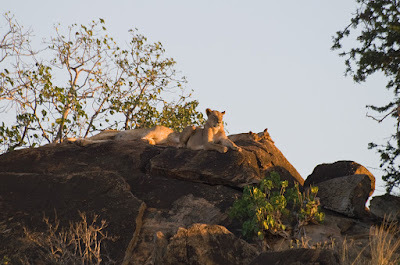 We found another pride with several small cubs resting up in the evening light at the lookout rocks near the Voi Safari Lodge. These lions were almost impossible to spot until we scanned the rocks with binoculars. Once we found an adolescent male looking very sorry for himself. He was making plaintive contact calls but there were no other lions around and he looked too young to have left the pride unless his pride had been taken over by new males, who would have killed him if he didn't leave. 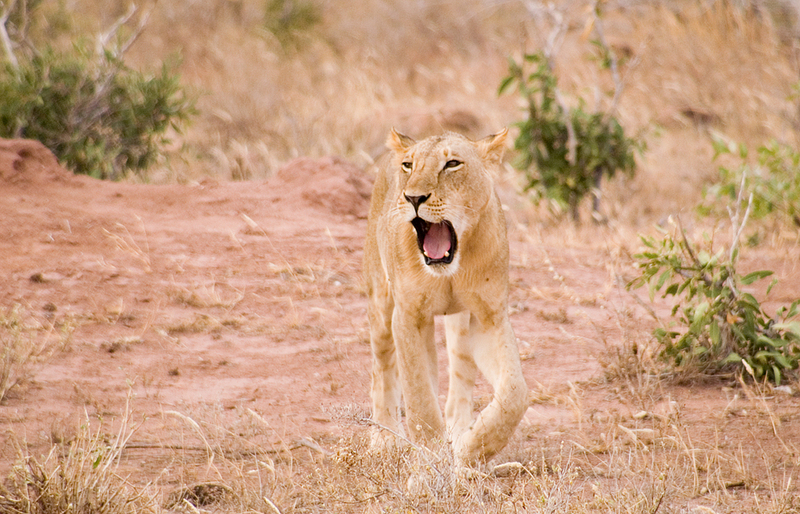 Some of our best memories of the lions of Tsavo, though, have come through instances when we haven't even seen them. There can be few things in life more thrilling than to lie in your tent, listening to the insects and the sweet hoot of the Scops Owl, with just a sheet of nylon between you and some of the World's most powerful predators. Your first night in a tent in the African bush is always a thrill. As the darkness draws in, the lions stir. Night-time is the time for hunting and also the time for patrolling and guarding their territory against intruders. The males roar across the wilderness and in your tent, you feel the hairs on the back of your neck stand up. A lion's roar will carry several miles and to the uninitiated, a roar half a mile away can sound like it is only yards away. However, if a lion does roar only yards away from your tent, your whole body will vibrate with its power and you will freeze in terror; your senses will become hightened as adrenalin rushes through your body, triggering your "fight-or-flight" responses. It is a truly awe-inspiring experience! Probably our most bizarre lion experience in Tsavo East happened at the public campsite at Ndololo. During the night, we were woken not by a noise but by a feeling; a feeling that something was very close by. Straining to hear what it might be, we could only vaguely perceive the faintest of footfalls. We thought nothing of it and were soon back aspleep. In the morning, we were packing up the tent and detected a strong smell of feline urine on it; then we spotted the footprints! Unmistakably the prints of a very large lion, they were almost the size of a tea-plate across. It seems we had been marked by a lion in the night! We will conclude this post with one final little snippit from history. When the lunatic line was finally completed and the first train arrived at the station on on the shores of Lake Victoria, there were many dignitaries there to celebrate. A speech was made by the Junior Minister for Transport in the Colonies to commemorate the occasion. I doubt many of you will have heard that speach but you will be aware of some of his other speaches, for he was none other than Winston Churchill. If you have enjoyed this post, please consider making a donation to our chosen charity Save The Elephants to help with their ground-breaking work in understanding elephant society and helping to prevent human/elephant conflict in ways which benefit rather than penalise the local population. In our next post, we will be sharing some of the amazing experiences we have had with the 450 plus species of bird that can be found in Tsavo East.